Please join us for Evening With An Artist on Saturday, August 23rd. Ralph White and Bonnie Landau will be showing and discussion of their latest works, all to support the Redondo Beach Art Group (RBAG). The evening will provide an eclectic atmosphere where artists and art lovers can mingle and learn more about RBAG’s mission to create a cultural arts center in Redondo Beach. A suggested donation of $20, along with 30% of any art sales, will go to support the Power of Art , RBAG’s major fall exhibit. 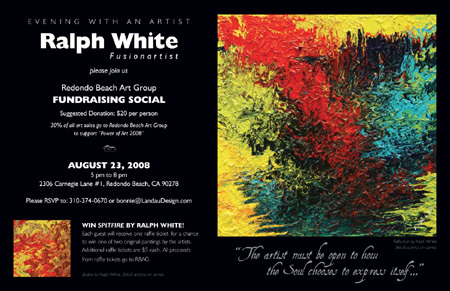 Each attendee will receive a raffle ticket with a chance to win Ralph’s original work, Spitfire . Bonnie will be raffling her painting, First Glimpse of God . Come to this groundbreaking event and share your love of art and the community.